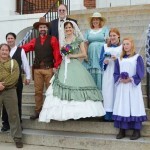 On July 13th, during the Living History Saturday, a mock wedding was held on the Edgefield Courthouse steps. 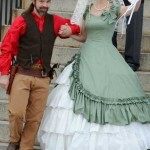 Set in 1862, Justin Guy was one of the many young men heading off to fight in the War Between the States, but before he left, he wanted to marry his sweetheart, Tonya Browder. As the ceremony was taking place, another man, Ike Carpenter, made an appearance. It seems that he had been promised Miss Browder’s hand by her late father and had been working on the family farm to earn her love and respect. Now he felt betrayed and vehemently contested the wedding. He plead with Miss Browder and exchanged harsh words with Mr. Guy. Finally, it escalated into violence as both men drew guns and fired on each other. Mr. Carpenter was killed and the wedding recommenced. 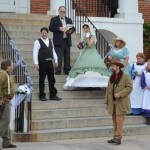 It was a happy day for everyone except Mr. Carpenter and just goes to show that, in Edgefield, duels will break out even during a wedding ceremony. We hope that people enjoy the Living History Saturday reenactments. 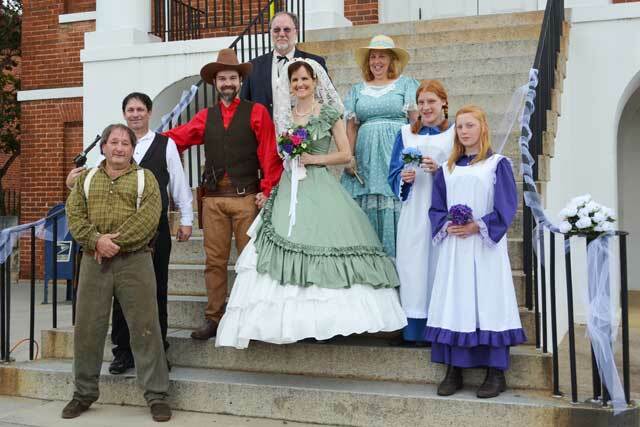 There will not be a Living History Saturday event in August or September, but the Southern Studies Showcase and the Heritage Jubilee that will be held in September in Edgefield will both have historical reenactments.